As consumers are increasingly asking for food chains transparency, widespread labour abuses are being documented in Northern Mexico, in Washington State and more recently in Australia too. Connecting the field to the grocery store seems to be the best means to bring back labour rights for farm workers (often times migrant) feeding us year-round. Two paradigms have emerged. On the one hand an urge for a sustainable food system and on the other hand, boycotts and strikes revealing a food system which is socially sustainable is extremely challenged. Locally, challenges are also very perceptible. Every year, almost 10,000 mostly immigrant and migrant workers carry out a range of tasks in support of British Columbia’s horticultural industry. This workforce, which is so essential to this industry, to the families and communities that derive their livelihood from horticulture, and to the safety and quality of BC fruits and vegetables, comprises one of the lowest paid, least protected, and most vulnerable occupational categories in the province. Agriculture is also among the most dangerous jobs. The modes by which immigrant and migrants are incorporated into the labour market construct them as highly vulnerable workers, particularly in terms of health and safety. To what extent can we claim our food system to be sustainable? What needs to be implemented to reach social sustainability in our food system, both locally and globally? 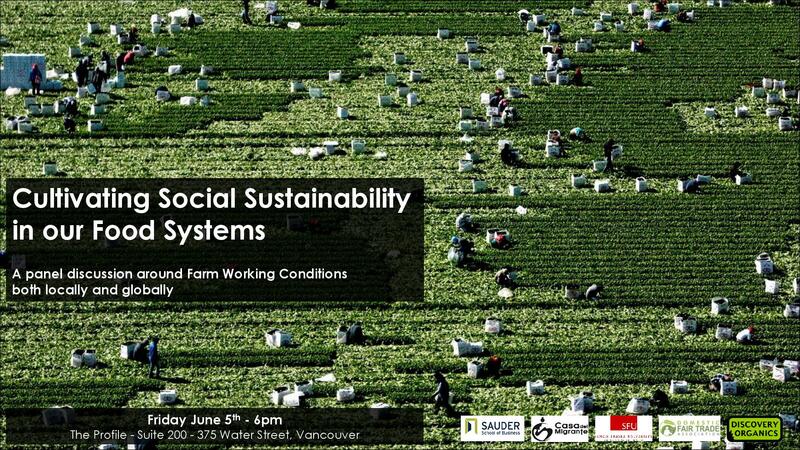 David Fairey has an MA in Labour Economics from the University of British Columbia. He has been a Labour Research Economist and Labour Relations Consultant in BC for over 30 years, and Director of the Trade Union Research Bureau since 1989. David is now the director of Labour Consulting Services and is also a CCPA–BC research associate. Gerardo Otero is professor of Sociology and Latin American Studies at Simon Fraser University. He is the author or editor of four books and dozens of scholarly articles and book chapters. His new edited book is Food for the Few: Neoliberal Globalism and the Biotechnology Revolution in Latin America, published in 2008 by The University of Texas Press. Fr. Patrick Murphy is the director of Casa del Migrante, a house of hospitality in Tijuana where migrants receive room and board as well as medical assistance and orientation regarding migrant issues. Fr. Pat has been a member of the Missionaries of St. Charles – The Scalabrians since his first profession. During the course of his seminary formation, Fr. Patrick had the opportunity to live both in Mexico and Puerto Rico. Mark Thompson is a professor of Social Sciences at the Sauder School of Business at UBC. He teaches Industrial Relations in the Organizational Behaviour and Human Resources Division. His research interests involve but are not limited to the impact of NAFTA labour accords and the management of industrial relations. He has published numerous scholarly articles, book chapters and papers on industrial relations, collective bargaining and occupational health and safety.